Embedded within the acetabulum of the pelvis lies an important structure known as articular cartilage; this cartilage has two very important functions. First, the smooth, low friction surface of the cartilage allows the hip joint to move freely in all planes of movement. Second, the articular cartilage cushions the hip during weight bearing activities, providing an important shock absorption function to the entire lower extremity. 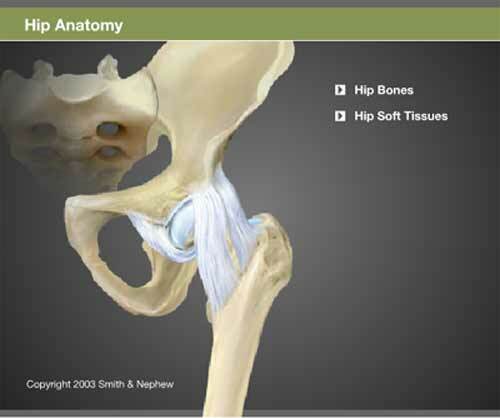 The muscles of the hip joint have dual responsibilities. They provide the dynamic functions necessary to raise and lower the lower extremity as well as the stabilizing functions required during standing, walking, or other weight-bearing exercises. This complex system of muscles works synergistically to provide the power for the hip to move in all directions, as well as to stabilize the entire lower extremity during weight bearing activities.